Source: Interface Logic Systems, Inc.
An empty truck enters the yard for loading and boards the scale. The operator enters the Truck Number in the window presented by the ILS ScaleSystem. The operator may bring up a list of all trucks in the system from which he may select. He then either hits Enter or clicks on "OK". If a Radio Frequency Identification System is in use the RF Reader scans the truck's RF ID tag, selects the scale and enters the Truck Number automatically. 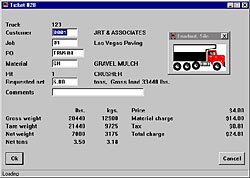 The operator is presented with a facsimile ticket which includes all data which is either assigned within the Truck Record or corresponds with the truck's last visit, including Customer, Job, Material and Requested Net Weight. Data may be changed at this time. When the operator accepts the transaction data, the ScaleSystem will begin the loading cycle by opening the discharge gates. Increasing weights and a graphical representation of the truck being loaded will be displayed on the screen. Upon completion of weighing a ticket will be printed and the vehicle may proceed. Interface Logic Systems, Inc., 3311 E. Livingston Avenue, Columbus, OH 43227. Tel: 614-236-8388; Fax: 614-236-8122.